As the retail industry - and every other industry for that matter - becomes increasingly automated, the race for improved customer service is heating up more than ever. While some stores are starting to replace their employees with robots to help customers find the products they’re looking for, others are looking for a more human way to engage and serve. After all, your customers are humans, and who better to help those humans find the best products for their needs than other humans? That being said, there are a number of tools and techniques that can help keep your staff on the same page and ready to serve customers better than ever before - without having to replace their brains with hard drives. Put those thinking brains to the test. Many people enter a store without a concrete idea of what they’re looking for, and that’s where your brain-equipped employees can help. You hired your staff for a reason, and it probably has to do with the fact that they know a little something about the industry. Empowering staff to come up with creative solutions or ideas for customers will give every person who walks into your store a more personalized experience - and keep them coming back. Put computers in their hands, not in their heads. The key to keeping up with the inundation of technology in your industry is to capitalize on the right tools for the right reasons. Communication can be a huge struggle for businesses with dozens or even hundreds of employees, especially when your business consists of giant stores spread across multiple locations. Keeping everyone on the same page about new arrivals or updates to the inventory is easy with cloud-based team messaging tools. This way, managers can get in touch with all staff members or specific departments even when they’re spread out across the floor. Make sure your employees are properly programmed. It doesn’t take a software engineer to program employees to be good at their jobs - all it takes is a little bit of training. Make sure staff have a solid understanding of the inventory before setting them loose on the customers. Start with a shadowing period to give new hires an in-person understanding of what it’s like to be on the floor. The shadowing system also gives customers a chance to see that your business cares about its customers and providing good customer service - without having to tell them. Customer service shouldn’t end when your customers leave the store. Many times, people have questions or problems with their purchases when they get home - and there’s nothing more frustrating than being excited about a purchase only to realize you can’t figure out how to use it (looking at you, IKEA bookshelves). Offering an online chat or quick-response email system (quick being the key word here), will keep customers feeling you’ve got their back even when they’re not specifically looking to buy something. 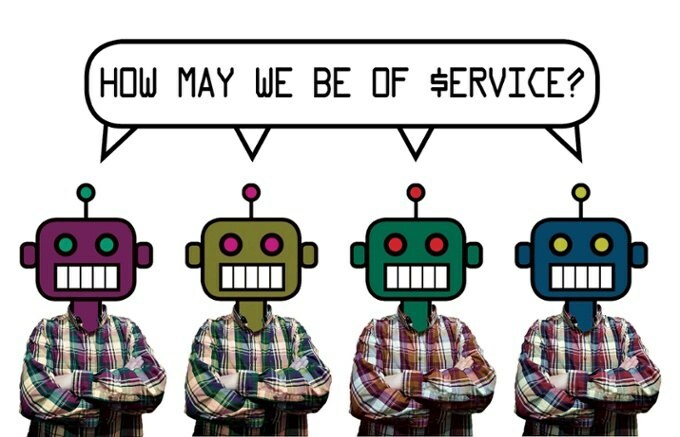 Great customer service doesn’t have to come from robots, but it will take a little finesse and training. And great customer service starts with great employee care. We all know the customer comes first, but before the customer has to come a well-trained employee ready to serve up some helpful, human service.